InterContinental Hotels & Resorts is proud to announce the InterContinental Washington D.C. – The Wharf and Eric Lu, culinary student at the Art Institute of Washington, as winners of the fifth annual Ultimate Culinary Clash, which took place on Thursday, May 17, 2018 at the InterContinental Washington D.C. – The Wharf hotel. Eric worked closely with Executive Chef Kwame Onwuachi behind the hotel’s Kith/Kin restaurant and his Art Institute colleague and sous chef Adrienne Wilson to execute his dishes for the evening. Part student cooking competition and part scholarship fundraiser, the Ultimate Culinary Clash brought together the winners of four regional Culinary Clash competitions to face-off against each other to see whose dishes reigned supreme. Eric received a $5,000 scholarship from the InterContinental brand and student sous chef Adrienne Wilson received an additional $2,500 in scholarship. The event welcomed more than 200 clients, industry tastemakers, and media for a competitive culinary evening where guests were encouraged to taste and mingle with chef and student teams from InterContinental San Francisco, InterContinental Mark Hopkins, Presidente InterContinental Mexico City, and InterContinental Washington D.C. - The Wharf. Local judges included Kate Gibbs with Destination DC, Tierney Plumb with Eater DC, Lauren Rosenberg with Smithsonian Associates, Susan Able from Edible DC, Erica Moody – editor and publisher at Washington Life, Richard Brandenberg, Director of Culinary Strategy at EDENS, Jamie MacBain with Diageo, Michelle Scholtes, blogger for The Hungry Lobbyist and Hangry District. Over the course of three months, four InterContinental properties across the United States and Mexico held local competitions with culinary students. 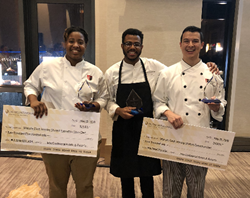 The first place winners from each hotel received the opportunity to move forward to the Ultimate Culinary Clash where they presented a small portion of their winning appetizer and entrée. Events guests, who judged dishes based on taste, creativity, and presentation, were impressed by the team’s Maine Lobster "Piri Piri" with charred pineapple, cilantro, puffed quinoa and West African Ground Nut Stew with braised chicken, toasted coconut greens, spiced potato crumble. This year’s Ultimate Culinary Clash sponsors included Steelite International, Sterling Caviar, kikkoman®, Trinchero Family Estates, Royal Cup Coffee and Tea, and Diageo. The Ultimate Culinary Clash serves as an opportunity for the InterContinental brand to showcase its commitment to culinary excellence. The regional competitions – called the Culinary Clash - began seven years ago at the InterContinental San Francisco’s Luce restaurant. To date, the program has raised more than $100,000 in scholarship for students across North America. InterContinental Hotels & Resorts has 194 hotels located in more than 60 countries with local insight that comes from over 70 years of experience. As a brand, we believe that superior, understated service and outstanding facilities are important, but what makes us truly different is the genuine interest we show in our guests. Our desire is to help guests make the most of their time. We connect our well-traveled guests to what’s special about a destination, by sharing our knowledge, so they enjoy authentic experiences that will enrich their lives and broaden their outlook. For more information about the InterContinental Hotels & Resorts brand, visit http://www.intercontinental.com. Find us on Twitter http://www.twitter.com/InterConHotels, Facebook http://www.facebook.com/intercontinental or Instagram http://www.instagram.com/intercontinental. community The Wharf, the InterContinental Washington DC – The Wharf will change the DC hospitality landscape come fall 2017. A contemporary, yet sustainable take on luxury, the 278-room waterfront hotel will incorporate the storied past of the surrounding community while infusing a fresh take on the guest experience. For business and leisure travelers alike the InterContinental Washington DC – The Wharf will be the gem of the Potomac waterfront. For more information, visit InterContinental Washington DC – The Wharf’s website. The Art Institute of Washington, a branch of The Art Institute of Atlanta, GA is one of The Art Institutes, a system of non-profit schools throughout the United States. Programs, credential levels, technology, and scheduling options vary by school and are subject to change. Not all online programs are available to residents of all U.S. states. Some institutions in The Art Institutes system are campuses of Argosy University. The Art Institute of Washington, 1820 N. Fort Myer Drive Arlington, VA 22209 © 2018. The Art Institutes. For additional information on The Art Institute of Washington please visit https://www.artinstitutes.edu/arlington. IHG® (InterContinental Hotels Group) is a global organisation with a broad portfolio of hotel brands, including InterContinental® Hotels & Resorts, Kimpton® Hotels & Restaurants, Hotel Indigo®, EVEN® Hotels, HUALUXE® Hotels and Resorts, Crowne Plaza® Hotels & Resorts, Holiday Inn®, Holiday Inn Express®, Holiday Inn Club Vacations®, Holiday Inn Resort®, avid™ hotels, Staybridge Suites® and Candlewood Suites®. IHG franchises, leases, manages or owns nearly 5,400 hotels and 800,000 guest rooms in almost 100 countries, with more than 1,700 hotels in its development pipeline. IHG also manages IHG® Rewards Club, our global loyalty programme, which has more than 100 million enrolled members.